Pakistani squash player Mohammad Hamza Khan became Asia's Under-15 champion after defeating India's Arnaav Sareen in the Asian Junior Individual Squash Championship, a press release from Pakistan Squash Federation (PSF) said on Saturday. Hamza won a gold medal in the U-15 category after he defeated Sareen in straight sets of 11-6, 11-9 and 11-9. In the Under-17 category, Pakistan's Haris Qasim bagged a gold medal after defeating Amir Azhar of Malaysia with a score of 10/12, 8/11, 11/9, 11/5, 11/9, a PSF press statement said. 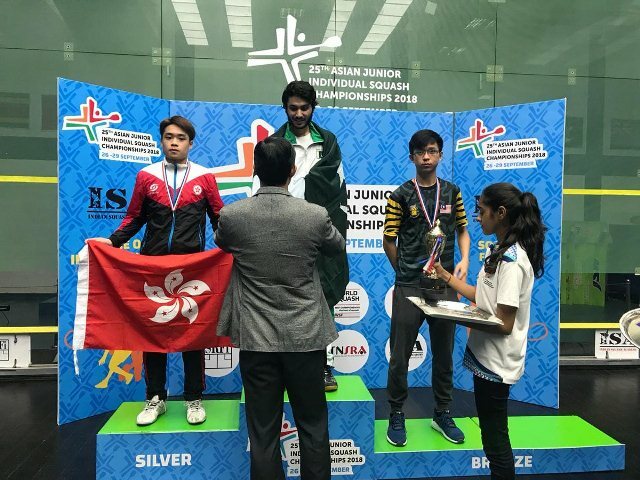 Pakistan also emerged victorious in the Under-19 category as Abbas Zeb took gold after defeating Hong Kong's Chung Yat Long with a score of 11/4, 11/3,11/4. Anas Ali Shah, who contested in the U-13 category, won a silver medal after he lost to India's Yuvraj Wadhwani. Zeb and Uzair Shaukat played in the U-19 category while Qasim and Asadullah Khan played in the U-17 category. Hamza and Muhammad Ashab Irfan contested in the U-15 category while Anas participated in the U-13 age group. Fazal Shah accompanied them as coach during the event. Seven players along with a coach attended the championship which was organized by the Tamil Nadu Squash Rackets Association under the aegis of The Squash Rackets Federation of India from September 26 to September 29.